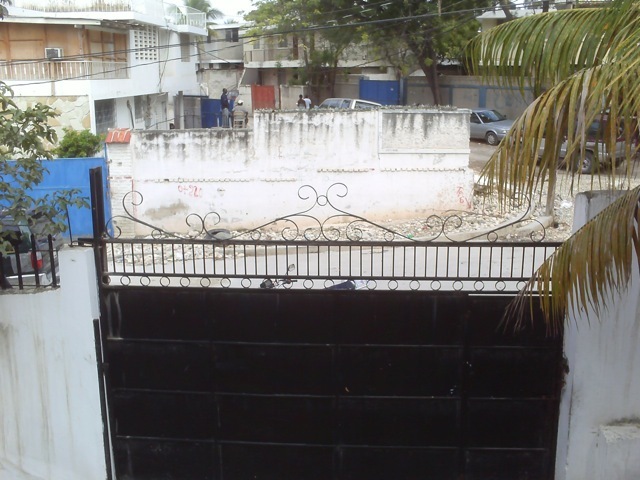 HURAH: On The Ground in Port-Au-Prince | HURAH! 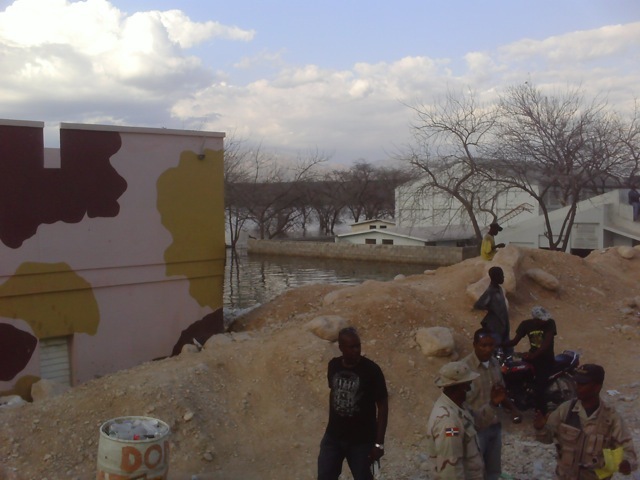 HURAH arrived in Port-Au-Prince via the Dominican Republic on Wednesday, February 17th. Fr. 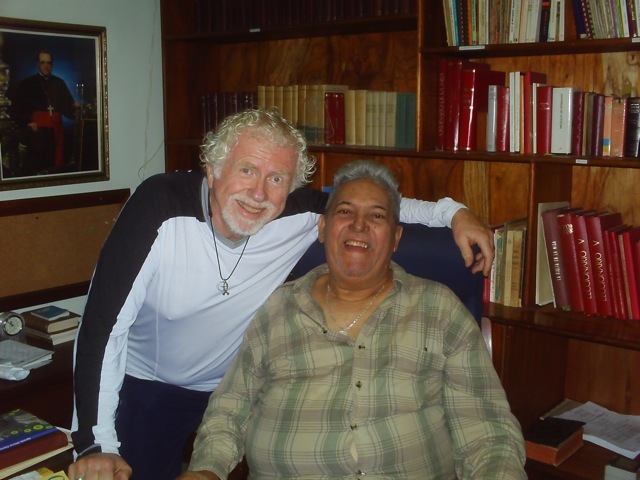 Ricardo Santileses of the St. James the Apostle archdiocese in Santo Domingo, a seminary classmate of HURAH President Tom Luce, assisted in making travel arrangements to Haiti. 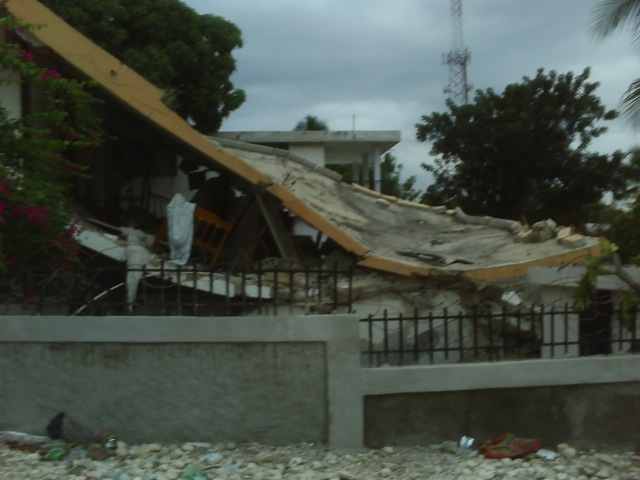 Originally the plan was to fly directly to Port-au-Prince, but many commercial flights have been cancelled. The primary route into Haiti is over land through the Jimani Mountains. Bus fare was $40 one way plus a $29 exit tax. Tons and tons of relief supplies and materials pass through every day. 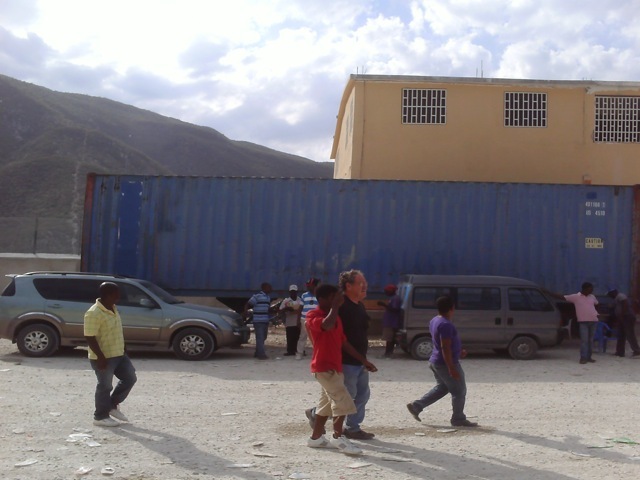 Here is a bus with a trailer full of goods on its way into Haiti. 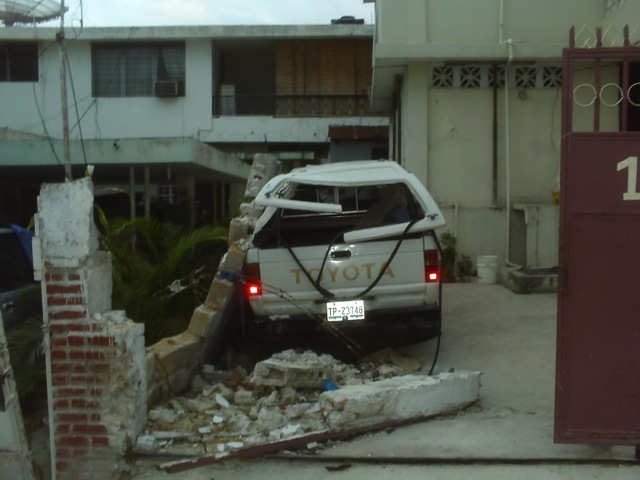 The earthquake damaged much of the interior of the country as well. As you can see below, the tremors altered the contours of a lake near the Dominican border and submerged several houses on its shores. With no running water and only intermittent electricity from AUMOHD’s generator, alternative means for purifying water and cooking are required. 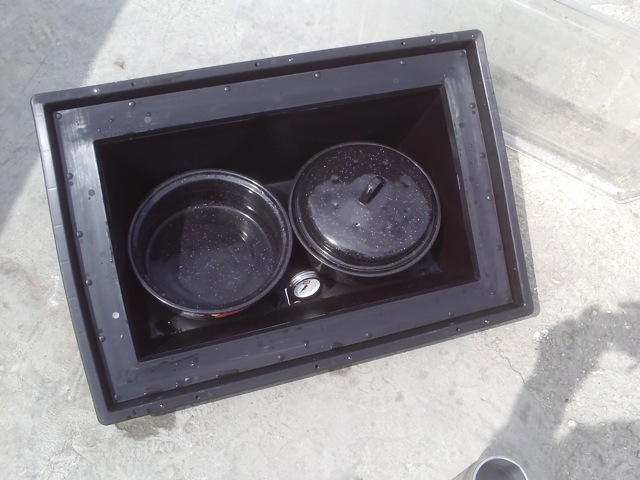 HURAH brought along this donated solar oven. 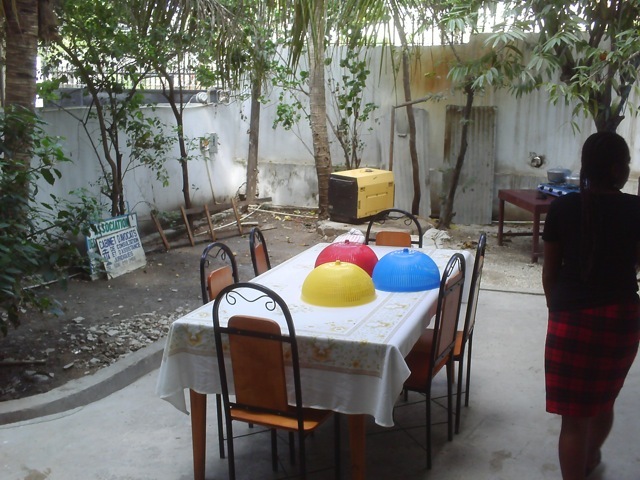 AUMOHD’s headquarters in the Delmas neighborhood of Port-au-Prince, rented with funds donated by HURAH supporters, survived the earthquake largely intact, and has become a hub of relief activity. 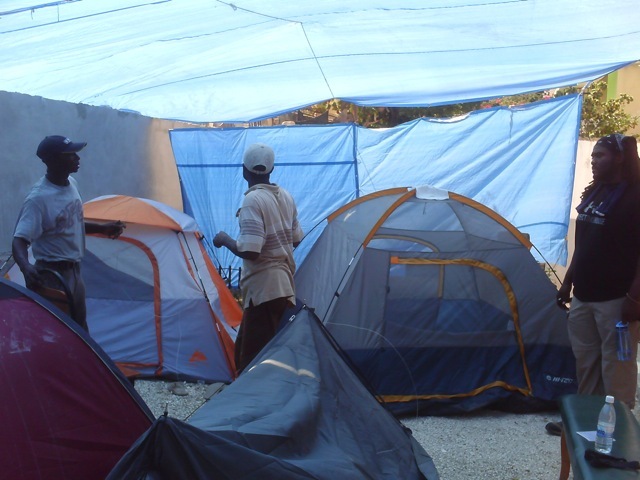 Its courtyards are now filled with tents, tarps and relief workers from several different groups, including members of the American Center for International Labor Solidarity (ACILS), an international labor organization affiliated with the AFL-CIO. ACILS generously donated equipment to AUMOHD to replace the computers, printers and office equipment destroyed in the quake, shown here. 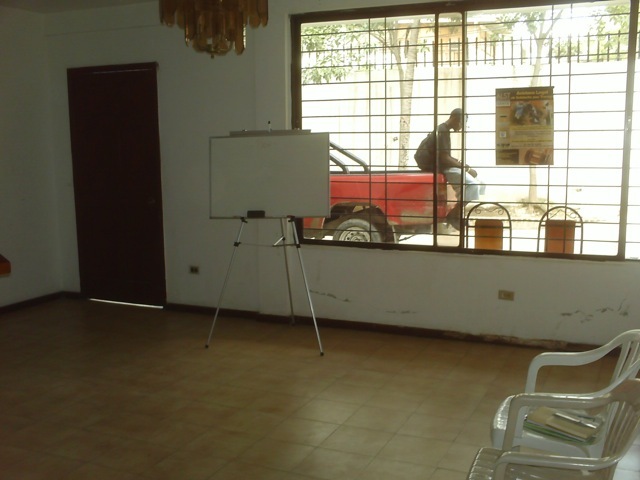 AUMOHD’s headquarters has become a “safe” zone for Haitian labor activists receiving organizational assistance and tactical advice from ACILS. Either they didn’t have offices before, or their offices were destroyed. 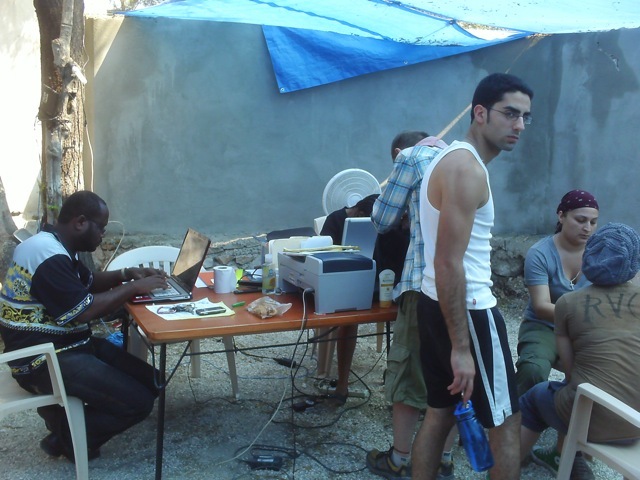 Labor representatives can come here to use the internet, telephones, printers, and copiers – all essential tools to organizing for worker rights in the aftermath of the quake. 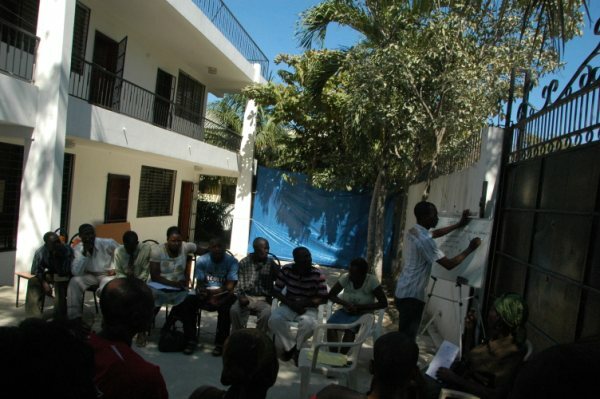 The offices are secured by are wall surrounding the entire compound, and have quickly become a center for conducting meetings, organizing among relief groups, and providing shelter for Haitian and international volunteers. 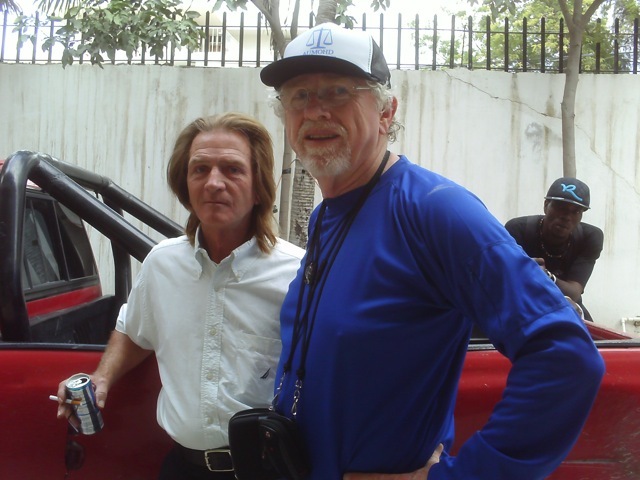 Tom Luce ran into Michael Brewer, who has worked with Haitian street children for years, and to whom AUMOHD provides legal assistance. Here are a few more photos of the AUMOHD compound and surrounding area – miraculous that it survived the quake at all when compared to damage to adjacent buildings. An urgent fundraising need for AUMOHD will be next year’s rent on the facility, which will come due in a few months – last year’s rent was donated entirely by HURAH supporters. Why some buildings collapsed and others didn’t is a mystery. 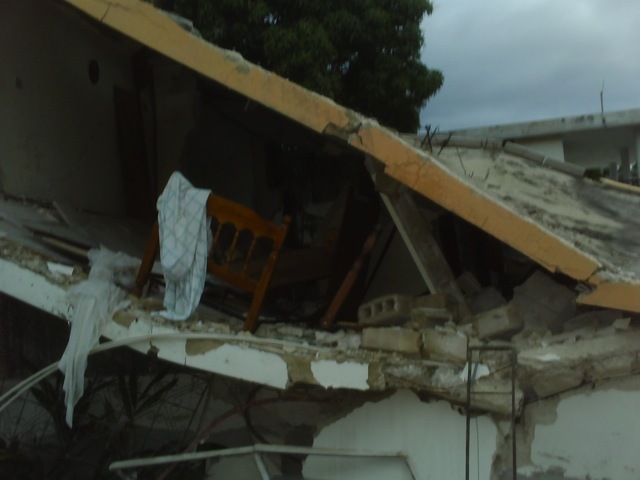 Most Haitians are still afraid to sleep in buildings that survived, and for good reason – strong aftershocks are a daily occurrence here. Vehicles were few and far between even before the quake, making functioning ones quite the commodity. 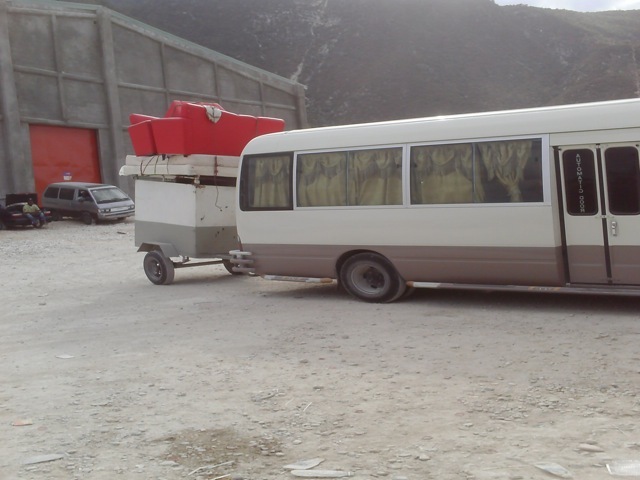 Up next: The AUMOHDmobile and a visit to one of Port-Au-Prince’s Tent Cities.